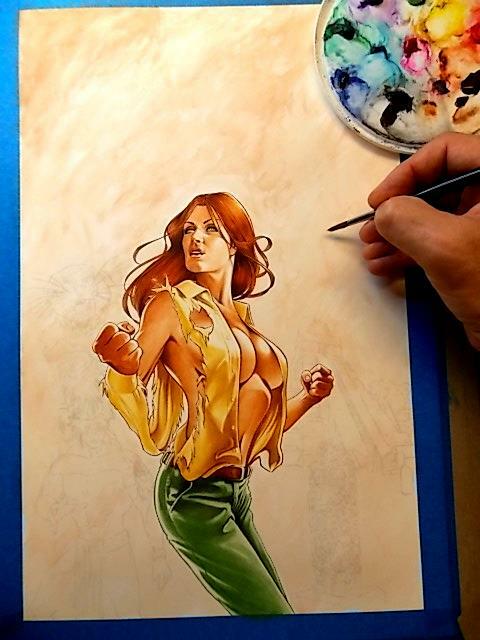 Cover artist Mark Sparacio has posted online his cover art work in progress for The Scarlet Jaguar, and we couldn’t be happier with what we’re seeing! Now would be a good time to mention that 104 copies of The Scarlet Jaguar have been preordered. And remember that if you are one of the first 100 people to preorder the book, you will get a limited edition (collectible?) laminated bookmark. However, since several people have ordered 2, 3, and even 4 copies of the book (but they only get one bookmark), we still have several bookmarks left to be claimed by the next people who preorder the book. BTW: There’s a pretty good chance the image above will be on the bookmark!